The finished fish-glue tempera painting of Paracelsus. Being a glue-size work it does have a different aesthetic to an oil painting. For one thing overpainting is extremely difficult, subsequent applications very easily lift off previous paint. Because of this, in many ways it behaves rather like fresco secco in the method that the image is most easily built up in "slashes" and "dabs". As a painting medium it also has some similarities to buon fresco in that it can lift off the support as buon fresco can off its wet plaster surface. However, once dry it's pretty sturdy, and with a modern varnish it's permanent. 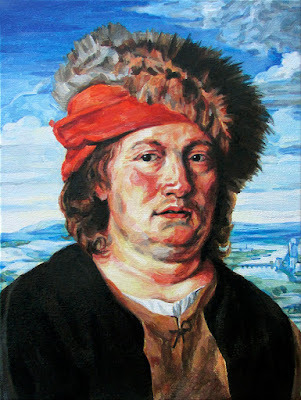 It's hard to really get across just how famous Paracelsus was in his time, he really was one of the first great "modern" medical doctors that broke away from the previous Medieval concepts of the body. Paracelsus’ Latin motto is "Alterius non sit qui suus esse potest" which means "Let no man belong to another who can belong to himself." However, it's a slightly clumsy rendering and could also be rendered as "A man that knows himself can never be another's slave".